Sri Lanka captain Dinesh Chandimal apologised to Rangana Herath after the veteran spinner's last Test ended in a thumping 211-run defeat to England in Galle. Herath was the final man to be dismissed on Friday as Sri Lanka were bowled out for 250 in their second innings, having been set a mammoth target of 462. 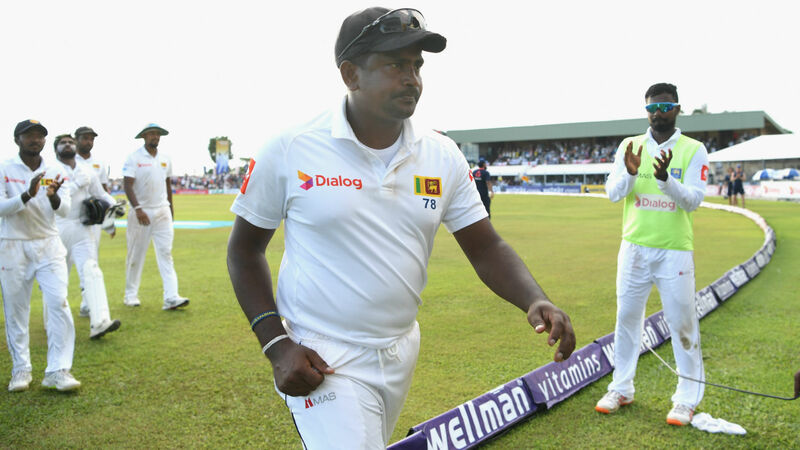 The 40-year-old ends his illustrious Test career with 433 wickets - placing him joint-eighth on the all-time list - and Chandimal was disappointed to see his team-mate bow out on a losing note. "It's a really hard day for us because we all know how much Rangana has done for the team and Sri Lankan cricket," said Chandimal in the post-match presentation. "It's a very emotional day. We wish him a very good future. We will have to say sorry to him. We couldn't give him a really good farewell in his last game, so we apologise for that. "Rangana was a really big part of Sri Lanka Test cricket. He has done so much for the team and Sri Lanka, especially off the field. You can go to him and he has given really good advice. He is a tremendous man and a great human being." England took control of the series opener as they recovered from 103-5 on the opening day to post 342 all out, thanks largely to Ben Foakes' debut century, and then rolled Sri Lanka for 203. England won the 1st Test by 211 runs and take 1-0 lead in the 3-match series! "Our batting was below par and, if you display that kind of batting, you can't stay in the game," Chandimal added. "Credit goes to England. They played some outstanding cricket. "We got a really good start in that first session but we couldn't capitalise. Ben and Jos [Buttler] batted really well. We fought hard as a bowling unit but we couldn't get those wickets. "We need to regroup as a team. Batting is a main concern. We need to discuss where it went wrong." The home skipper's own efforts were hampered by a groin injury, providing a further worry for Sri Lanka with the second Test due to start in Kandy on November 14. "It's a grade-one groin strain," Chandimal explained. "I still don't know how long it will take [to recover]. It's up to the physio."